Meet the People Who Lost Their Jobs When Bill Janis Betrayed the Republican Party and Elected a Democrat | Virginia Right! Six of the Seven Assistant Commonwealth’s Attorney’s who were fired when Bill Janis split the Vote and elected a Democrat. In 2011 Bill Janis decided that he was not happy with the man who won the Republican Nomination for Henrico Commonwealth’s Attorney. By the time Janis came to that conclusion, it was far too late to do anything about it. Here in Virginia, we have a process. If you want to run for office, you fill out the proper paperwork, gather the required signatures and file to run. And pretty much anyone may file to run as long as you meet the requirements. Matthew Geary did all that. His nomination was uncontested and he won the Republican nomination because the deadline for others to file came and went and he was not challenged to a primary. And at some point, Bill Janis decided he didn’t like Geary. Or preferred the job himself. His motives were unclear to just about everybody who wasn’t an Establishment Republican. So Janis decided to commit a “sin” that is punishable by a 4 year ban from the Republican Party in Virginia – he ran as an Independent against a Republican. And you don’t need a crystal ball to know that Janis, a 10 year Republican insider would split the votes with the real Republican in the race and the Democrat would win. And that is exactly what happened. Bill Janis ran as an Independent and we now have a Democrat, Shannon Taylor, as the Commonwealth Attorney in Henrico. At least 7 people were fired as soon as Taylor took over the CA’s office. These were mostly non political people and some had been there in their job for 20 to 25 years. Gone. Wiped out. And all because Bill Janis didn’t like the man that won the Republican nomination. It is hard to justify this for any reason. And even more puzzling when you look at the Republicans who stabbed the party in the back with impunity. And I have heard the “official” party line story about Matt Geary. Money troubles. Marital problems. And other questions. But one thing I have learned is that the Republican spin machine rivals the Russian State run Media Pravda in it’s heyday. The story is almost identical no matter which Establishment Republican tells it. It’s like these party insiders have a memo they are required to memorize. So when I did an interview last year with a gentlemen named Mark Tate and he began to tell me his story from his 2007 primary run, I couldn’t help but see a parallel with the way his candidacy was torpedoed by the Establishment Republicans in favor of Jill Vogel, his Republican primary challenger and the eventual winner of the State Senate seat. I wrote this article last year and my research was part of looking into the candidates for the Republican nomination contest between Ed Gillespie and Shak Hill. And this research convinced me to endorse Shak Hill and seek Shaun Kenney’s ouster as Executive Director of the Republican Party of Virginia (that mission was accomplished!). You can read my interview write up with Mark Tate here, but I will summarize the applicable parts here. I spoke to a number of people I know about Tate before the interview. None had an unkind word to say about him. And during our conversation, I formed a positive opinion. Tate said his internal polling showed his race was a dead heat. He was under intense efforts from the Establishment Republicans to drop out, but he refused. “[Kenney] said, ‘By the way, did you know Mark Tate was going to be indicted?’ And he gave me the date,” said Tribbett, a Democratic activist whose freewheeling blog style has upset many politicians in both parties. On May 21, three weeks before the June 12 primary, the grand jury indicted Tate on two counts of election fraud and nine counts of perjury in a case that has deepened fissures in the party and raised questions about whether it can maintain its majority in the state Senate. Tribbett also said that Ed Gillespie, who was the head of the RPV at the time, and Kenney’s boss, knew about the indictment. Blogger Ben Tribbett tells the Washington Post that he was told about indictments against candidate Mark D. Tate before they were released. In a timeline on his blog, he implies Gillespie, who supports Tate’s opponent, also knew of the indictments in advance. And the accusations against Tate were eerily similar to those I have heard in the Party Line story about Geary. Of course when this story hit the papers, Tate’s campaign was through. There was nothing left to do but fight the charges. And at the end of the whole mess, Tate admitted to filing his financials late and was convicted of that. He told me he is probably the only one that has ever been convicted of filing late. This is a common occurrence, you pay the late fees and that’s that. Except when the Establishment gets involved. I’m pretty sure Mark Tate will never run for office again. And as one who has been subjected to the “extreme lobbying” from these establishment Republicans, I can understand what Tate must have gone through. In this day and age of “no bullying” can these intense efforts to persuade by the establishment Republicans be acceptable? We all know it didn’t end well for Matthew Geary. And it is impossible to say the bullying he no doubt was subjected to was a factor in his decision to end his life. But it is impossible for me not to at least believe it was a factor. And we will never know the truth nor will we know the entire story. But a lot of what happened is still out there. But this was definately a déjà vu for me. Take a look at this interview of Matthew Geary when the Henrico GOP machine was in full force against him. And this video was uploaded August 15, 2011 about the same time Bill Janis was filing to betray the Republican Party and run as an Independent. There have been a lot of statements made about Matt Geary since his death. In this video, he is a calm, determined candidate who is being pressured by the Henrico Establishment. After finding out Janis was running against the Republican nominee, Geary issued the following statement. “I am disappointed that Republican Delegate Bill Janis has decided to circumvent our own party process to run as an Independent. He is violating the Republican Party pledge that states that members must support all Republican Nominees. All Republicans interested in running for the Henrico Commonwealth’s Attorney were required to file a statement of candidacy with the Henrico County Republican Chairman no later than 5pm on Monday, May 9, 2011 and pay a $500 filing fee. I did that. 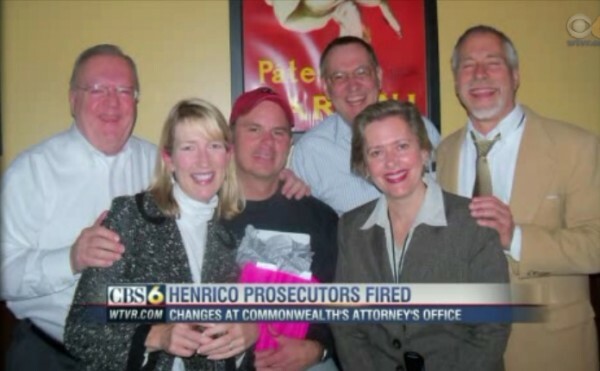 Effective July 1, 2011, I became the Republican Nominee for Henrico Commonwealth’s Attorney. Delegate Bill Janis missed the filing deadline. Hopefully he will reconsider. But if not, let the Henrico citizens decide on Tuesday, November 8, 2011 who is most qualified and experienced. As the Chief Deputy Commonwealth’s Attorney of the City of Richmond, I managed the day to day operations of the second largest commonwealth attorney’s office in Virginia. That office consisted of 41 prosecutors, and approximately 50 staff members and victim witness advocates. Additionally, I helped manage a budget of approximately 5 million dollars and oversaw human resources training, grant applications and managed all intra-agency relations with local, state and federal law enforcement partners. The behavior Matthew Geary describes in this video and the extraordinarily similar treatment received by Mark Tate represent everything that is wrong in Virginia politics. This is the Eric Cantor – Ray Allen slash and burn power game. But it is not a game to those who wind up in the headlights of these cancerous power mad politicians who do not care what happens as long as they win. No one involved in these horrible events deserves to hold public office. And that includes the Republican turned Independent Bill Janis. Here is a news clip of an interview with Geary that speaks to the Henrico Machine possibly running a “high profile” candidate against Geary. And note the mention of power broker Eric Cantor, who was no doubt quite involved in his Henrico GOP decisions. Thank you for taking us down memory lane, however tragic it may have been. We can’t let the voters forget. The RINOs don’t have the memories of the symbolic elephant that we conservative Republicans do. What Eric Cantor, Bill Janis, Delegate Jimmie Massie along with the other operatives of the Henrico Shadow government did to Matt Geary 4 years ago needs to be Face Booked and boosted monthly to remind the voters that the career politicians and their Pac money need to be purged from the Henrico County Republican Committee, the 7th District, and State Central Committees. Keep exposing the McGuire Woods and Dominion Power Political operatives who keep their mob bosses in power in Virginia government. We are listening to you and we are VOTING. We are taking our county and our state back one election at a time. What conservatives, particularly those that portend to be leaders of the movement do not understand is how to fight. They allow thug gangsters almost anything, and yet want to abide by some sort of gentleman rules . In the story yesterday on the I.R.S reversal and decision to return the $100.,000.00 they seized from the man running a convenience store in North Carolina, the headline read INTENSE PRESSURE WORKED. Nothing else does. The next time the republican establishment does something like this ( and you won’t have to wait very long) a coordinated and hard hitting effort would send a clear unambiguous message——we will hit back, and HARD. Until then all of the whining and griping , only to watch the lemmings line up at the next election cycle and knock on doors, man the phones, do the hard grunt work, only to watch them pee on your head AGAIN , as soon as they are done with you. I know how it feels. The VFRW and Henrico machine are the reason we have the issues we have in VA. I was told it was not my turn and get in line. The queens of slating. From Jeff Shapiro and RTD archives \”But it seems to boil down to one word: power — who exercises it in a bustling, prosperous suburb where politics has been moderated by a flood of come-heres, but where the political machinery is controlled by a handful of conservative from-heres.\” Having experienced the \”Machine\” firsthand, I KNOW it\’s all about power and who wields it. What we did last year in the Brat race disabled that machine, but they are hell bent in rising again. We cannot let that happen. NO MORE! I am thankful for Tom White allowing me to blog here and to disagree publicly with him (it also gins up the site a bit!) but this is a bit unfair. These men and women served at the pleasure of the elected Commonwealth’s Attorney. Now I do not wish a firing on anyone. But they could have expected the same or the possibility of the same if either Geary or Janis had won. To try to gin up sympathy here by this to get people mad at Janis begs the question: Why did Janis run? What purpose was served by the GOP in sliming their own candidate right after they nominated him? A real fire or just smoke? So this post does not help the voters decide if Janis was right to give up a safe seat to run for CA. I read the summary of the meeting with the Henrico County GOP Executive Committee concerning Geary and it raises some disturbing questions – either the 12 persons are right or Geary was. I wasn’t there. I am loathe to speak ill of the dead. But now my research also shows that then AG Ken Cuccinelli and then Lt. Governor Bill Bolling both endorsed Janis (and at least Cuccinelli was disciplined by the state party for it! ); were they wrong? I hope and pray voters make up their mind based on the truth not distortions. Tom White’s May 19, 2015 post “Meet the People Who Lost Their Jobs When Bill Janis Betrayed the Republican Party and Elected a Democrat” leaves me questioning whether Tom has a loose tether to the truth, or if the most likely explanation is that in his rabid support for Vince Haley in the 12th Senate District primary, he has willfully abdicated principle in favor of revisionist history. Whatever reason or justification Tom postulates for distastefully exploiting that tragedy, the bottom line is that Tom White climbs upon a precarious pious perch when he dares to accuse anyone of “waffling”. While I am generally offended by the continued exploitation of that tragedy for any reason, and I fundamentally disagreed with McSweeney’s interpretation of the Party Plan, I felt Tom revisited the tragic and unusual circumstances with fairness, objectivity, and sensitivity for all involved, including Bill Janis, so I emailed Tom to express my appreciation. “And I really hate to mention the story and would prefer to leave it alone but current circumstances make it unavoidable….What happened, who was involved and the tragic details are not relevant to the Janis story and it does no good to open the old wounds. I cannot reconcile those who continue making false allegations against the “Establishment Republican Party” depicting it as a mean spirited bullying machine, as being the very same people who now waffle, recklessly exploiting that tragedy in furtherance of a willful and intentional agenda determined to extract a pound of flesh from their political enemies. More to the point, neither Tom White nor anyone else in blogger sphere who have opined on the events were actually there or had any part or direct association with that very painful and difficult decision. Most ironic within all of his “reporting” is Tom’s stunning ignorance and inattention to detail in what is the most vividly flawed and erroneous assumption of all time regarding who compromised the “Establishment Republican Machine” that made the decision to abandon its nominee in the summer of 2011. The unanimous vote taken by the Henrico County Republican Executive Committee that night was documented objectively in the meeting minutes. Furthermore, the voting members were captured on video footage taken by Channel 6 news. It is quite undeniably clear that among the voting members was none other than Congressman Dave Brat. Congressman Brat attended, at his own request, to carry the proxy for a member who could not be present. Can anyone with a straight face describe Dave Brat of all people as part of the “Establishment”? As Tom White so aptly stated on January 29, 2015, “Anyone that knows the details of this situation completely understood and agreed with the decision by Janis to run as an Independent”….including obviously the least establishment Republican in recent history, Congressman Dave Brat. Bill Janis is not the person I thought he was. I too have been subjected to his temper and his demands. I was, frankly, shocked at the minutes of the meeting. These were not minutes, they were an exercise in creative writing full of opinion and “feelings”. There is no doubt in my mind after having been on the receiving end of the “intense lobbying” that is impossible to differentiate from bullying. This is a result of the relentless power grab by Cantor and his disciples. Matt Geary, in my opinion, would have won the election and been a great CA. And each and every person that went after Matt shares in the outcome. Pushing people over the edge with what I now know was bullying is shameful and completely unacceptable. Janis has walked out of Committee meetings and allowed taxes to be raised and has done the same with 2nd Amendment bills. There is a reason the VCDL did not endorse him. Cantor is gone. Ray Allen is no longer working for RPV money. The nasty cancer that has infected Va politics for so long is finally being cured. Bill Janis will metastasize everything that is wrong with Va politics. He will not represent the voters, rather the interests of the power brokers. It will be a sad day if Janis comes back into the political theater in Virginia. And we will all lose. He fooled me until he gave ma a reason to take a closer look. And I do not like what I see. At all. Voters should assess candidates in order to make the best possible choice, but we are talking about two different things here. You can decide not to endorse Bill Janis for the reasons you state, and some of those reasons may include new information that changes your opinion, but exploiting the tragedy of Matt Geary to do so is distasteful. You have opined more than once that Bill Janis did the right thing under the circumstances, as did the Henrico Republican Executive Committee, and the reasons you now put forward for not supporting Janis have nothing whatsoever to do with new information regarding his conduct or motives in 2011. The appointees in the CA’s office who lost their jobs when Taylor was elected were going to be replaced as is the normal process after a change in administration. Any person who serves as an appointee knows there is no job security so those 7 people knew they would be replaced on the day Wade Kizer announced he would not be seeking re-election. The HCRC Executive Committee meeting minutes are not an exercise in creative writing ,and you’ve no basis for stating that as a fact since you were not there. The people who were there, Dave Brat included, signed off on those minutes as a true and accurate accounting of what transpired during the meeting. I do not disagree with you at all regarding the toxic effect Ray Allen and that entire mafia had on RPV and especially on the HCRC, and in fact, I don’t disagree with you on much of anything regarding that, but I do take issue with you lumping the 2011 Henrico CA race in with the many horrible things that mafia did do. It’s neither true nor fair, and you yourself have said so more than once. We have plenty of real and legitimate issues to discuss in the 12th Senate District such as Stolle-Dunnavant approaching the Democrat Caucus to run as a Pro Medicaid Expansion Democrat before she announced her candidacy as anti-expansion conservative Republican. I personally know every one of the Assistant and Deputy Commonwealth’s Attorneys who were forced out when Taylor won. Most were apolitical and just wanted to prosecute. At least one was a Janis supporter. Finally, when Geary told these prosecutors that they were either “for him or against him” and that he would retaliate against anyone who didn’t publicly support him, it was evident that he would have fired many of them himself…he’d have had to, since he’d promised more jobs to people than were available in the office. I concur with Anne Davis, and find it rather distasteful to exploit the personal tragedy of Mr. Geary for political purposes. Mr. Janis had no hand in the unfortunate demise of Mr. Geary, that sad decision was made by Mr. Geary alone. The staff dismissals are no more the fault of Janis than Mr. Cucchinelli is at fault for McDonnell appointees losing their positions when McAuliffe won. When I made those statements you and Ann keep throwing in my face I was unaware of the intense bullying campaign that was being carried on against Matt. I believed the Henrico GOP propaganda that Matt was in deep debt and had unpaid bills, then I find out all you had was a $75 Homeowners Association bill. Everything I based those statements on has turned out to be GOP lies. You can be proud that you completely destroyed a man with your bullying. All in the name of power. All I can say is look at the videos I put out there. Matt, in his own words, describes the bullying. And I wan no part of anyone that carried out any part of this heinous act of bullying. We now have people like me who will blow the whistle on the dirty dealings within the GOP. Too late for Matt, but I won’t allow this stuff again on my watch.